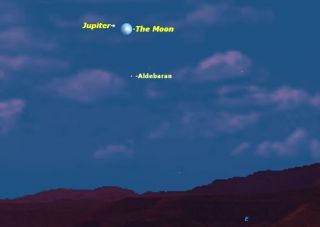 On Christmas night, December 25, look in the east just after sunset to see the nearly full moon next to the bright planet Jupiter. As darkness falls on Christmas night, check out the east-southeast sky. Shining brilliantly to the upper left of the bright, nearly full moon will be a silvery "star" with a steady glow. But that's not a star, or Santa returning to the North Pole. Rather, it's the largest planet in our solar system, Jupiter, serving as a sort of holiday ornament with Earth's nearest neighbor to cap off a year of interesting skwyatching events. As viewed from the eastern and central United States, the moon and Jupiter will appear closest together during the late afternoon or early evening hours on Tuesday (Dec. 25). From New York, they’ll be closest together at 6:25 p.m. EST (2325 GMT); from Chicago, it’ll be 5:18 p.m. local time (2318 GMT). The pair will be slowly separating as Tuesday night shifts to Wednesday morning; the moon moves across the sky at roughly its own diameter each hour. Jupiter will remain a bold light high in the east-southeast at nightfall. This week, it doesn't set in the west until around 5 a.m. local time. Appearing brighter than any nighttime star, Jupiter is now levitating in front of the constellation Taurus (the Bull), not far from the famous V-shaped Hyades star cluster and despite the nearby presence of the orange 1st-magnitude star, Aldebaran, which fills this region of the sky with overbearing brightness. What kind of telescopic observation can be made of the gas giant now? Almost every kind. From mid-northern latitudes you can even watch a full rotation of Jupiter, with the cloud features of every longitude displayed, during a single nightlong vigil. And as always, a fascinating dance of Jupiter's four large Galilean satellites will await viewers on any night who watch with a small telescope or even steadily held binoculars. As darkness falls over the eastern U.S. on Tuesday, you'll see two Jupiter moons — Ganymede and Callisto — on one side of the giant planet, while a third, Europa, hovers by itself on the other side. As the evening progresses, Ganymede and Europa will gradually pull away from Jupiter. Then, at 7:15 p.m. EST (0015 GMT Wednesday), the fourth Galilean satellite, Io, will emerge from Jupiter's shadow and appear on the side of the planet occupied by Europa. Slowly, as Tuesday night wears on, Io will become easier to see as it moves away from Jupiter and toward Europa. At 11:40 p.m. EST (0440 GMT Wednesday), you’ll see Io passing Europa. And Jupiter itself will continue to be a great target throughout the entire winter season for those who got binoculars or a telescope as a holiday gift.